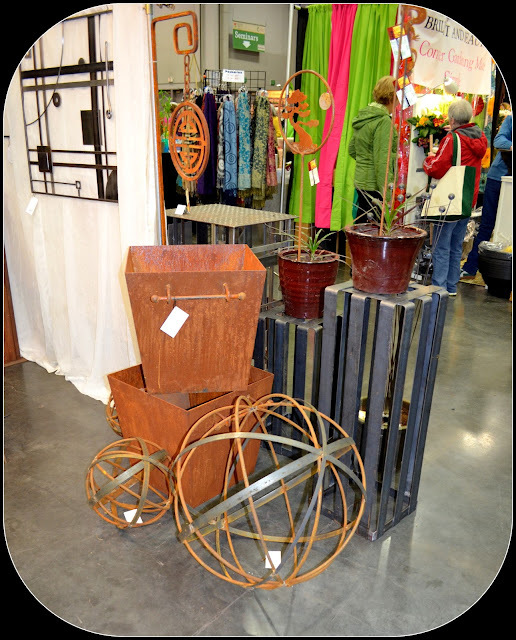 Absolutely one of the best parts about going to the Portland Yard, Garden & Patio Show was interacting with the vendors! Sometimes I wasn't sure who was more excited to be at the show, the vendors or garden geeks like myself?! 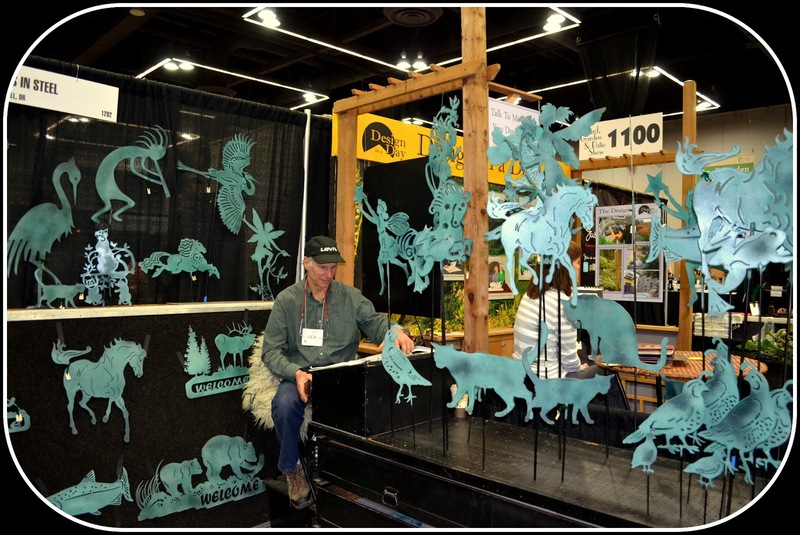 Metal Artist Terry Powers with Three Sisters Nursery, stole my heart with his recycle metal art. There were some fantastic metal artists at the show. These shows offer the public a great opportunity to meet talented artists and offer up the ability to support, local, small businesses. 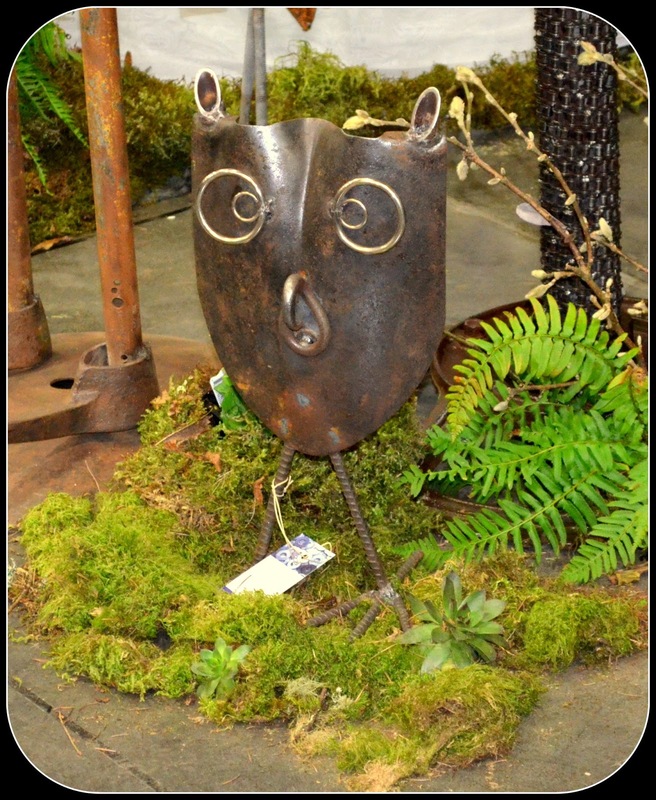 A metal artist new to me was Jen Ellsworth, who works with Fairy Forge, in Oregon City. Can we just say that I will be saving my money to get some of her metal art soon?!! 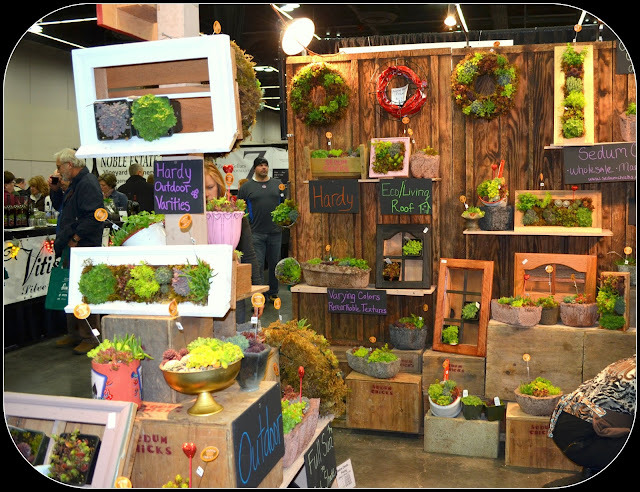 As always, I found the display from Sedum Chicks to be awesome. I love the primitive, farmhouse styled theme. I spent some time talking plants with Out in the Garden Nursery, and took home a few plants :) Ferns to be exact, really cool ferns. My delightful other new find was meeting George Bury, a shy, metal artist. A heron, like the one to the far left, came home with me. 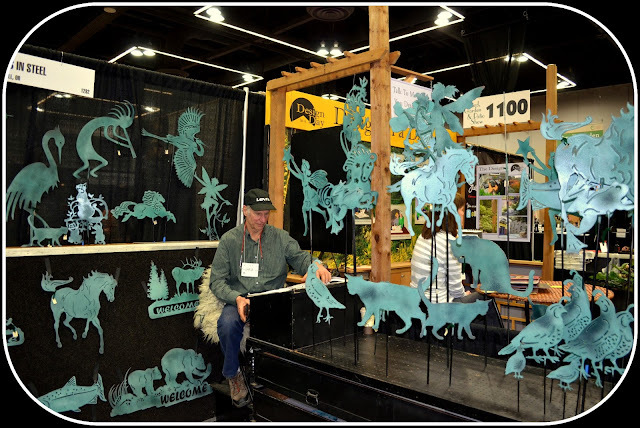 I really enjoyed talking to George, who is working out of Creswell, Oregon and unfortunately does not have a website to link you too. He said at this point, he is only doing shows. George is a great example of those of us, plunking away at our creative endeavors, just trying to live life in balance and harmony and keep a roof over our heads. 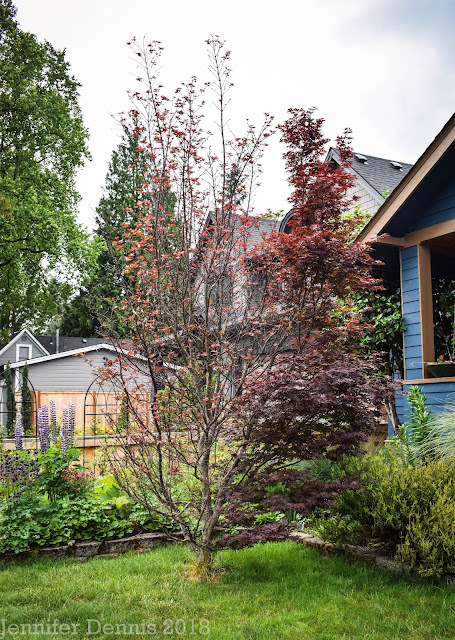 I find the world of gardening, and all it's connected interests to be a great place for meeting the best of people. I encourage you to think about how you spend your dollar and I encourage you to support small business, like local nurseries and artisans. You meet the neatest people. My last installment of the show will be to take a look at the theme'd gardens. Coming later this week! For a peek at my highlight of the show, find that post here. Look at all that cool stuff! I think I like seeing all the vendors as much as the display gardens. 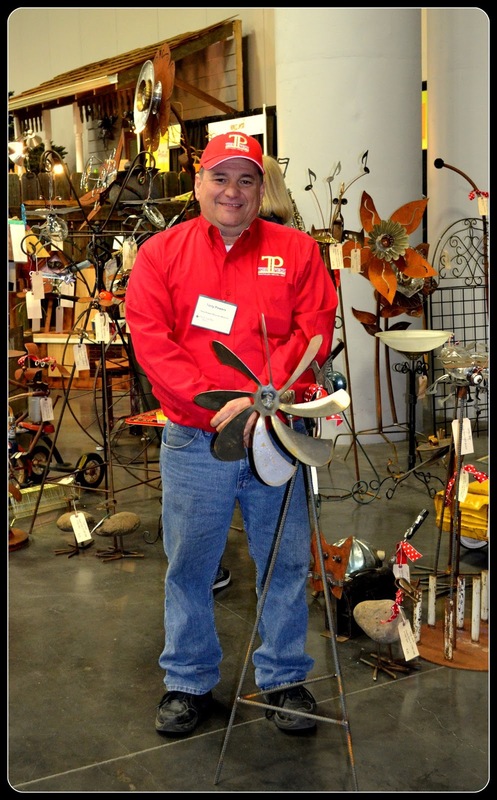 The heron will great in your yard and I hope you get that windmill too! I agree with what you said about the world of gardening being a place for meeting the best of people. Thanks for the our. And PS I love that rusty sphere with the cut out holes by Jeff Ellsworth. I love the vendors at garden shows! 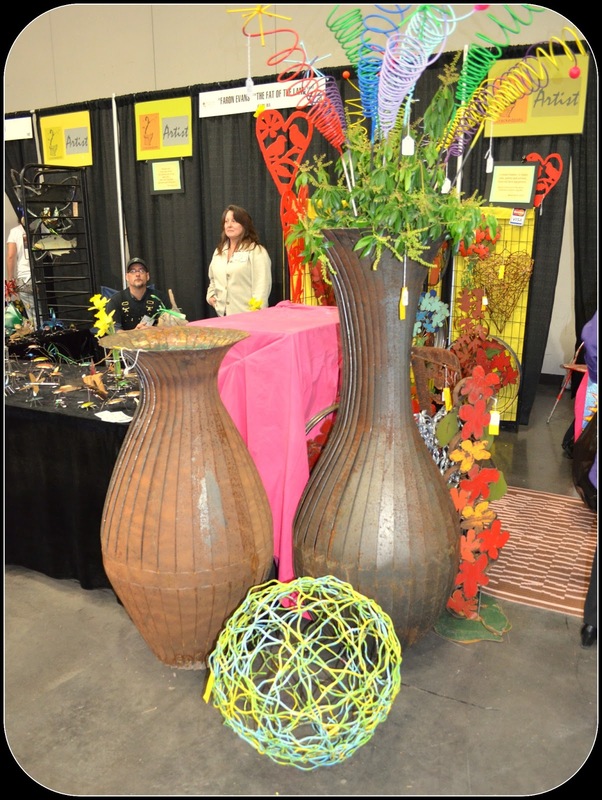 My favorite is also the sphere with the cut out holes by Jen Ellsworth! Your heron is cool! Thanks for sharing the great shots! What wonderful artwork! Great show and thanks for sharing. OMG, I want one of everything you photographed! 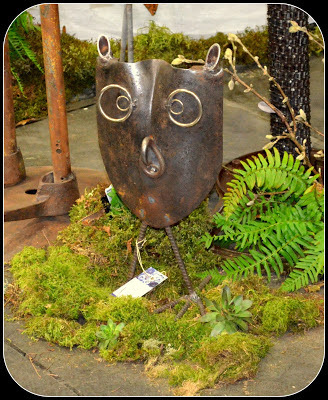 But especially that shovel head owl, that is cool. And all the rusty spheres. Another great post about the show, thanks so much! Wow! Some amazing stuff there. 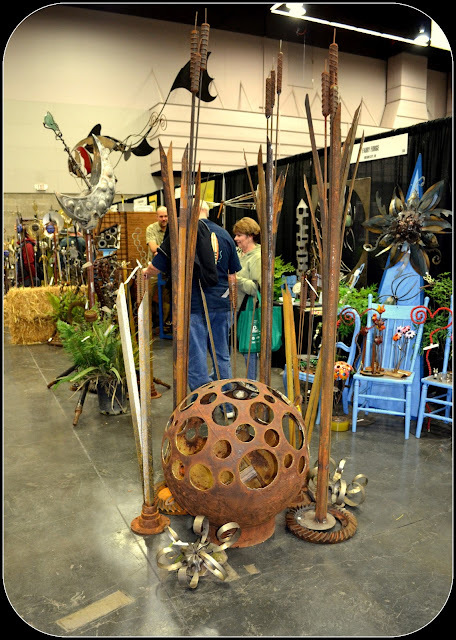 I'm not generally a fan of "Garden Art", but if I had been at that show, I might have been willing to change my mind. Thank you for sharing. I didn't get to go! The problem I have with the art is that it always looks much nicer at the show. I get it back to my yard and am never happy with where it is. I think I'll have to learn how to incorporate it in better because I see it in other yards and it looks great, but the beauty doesn't follow me home yet. I'm glad you found some you like though! Jenni, I'm so glad you are sharing your adventure at the show. Here in South Dakota we are lacking in the garden show arena. I love the 3 sisters site. His sea sculpture with the auger is amazing. Thank you for adding the websites. I really enjoyed your photos and then hopping to their sites. I clearly didn't have enough time to explore the show the day I paid for admission, as I missed this whole area. And I didn't know that Terry Powers worked in metal: I know him as the grower of a lovely Japanese maple we bought for the garden about four years ago!